The Mockridge family originally came from around Taunton in the county of Somerset, a connection that stretches back to the time of the Monmouth insurrection of 1685. By the 20th Century, the family had formed strong Forces links, with five of the menfolk to serve in either World War I or World War II (or in both, for Colonel Albert H Mockridge RA). George Albert Mockridge was born in February 1919 at Poole in Dorset, son of Albert and Dorothy Mockridge (née Gillberry). His father Albert, then Lt AH Mockridge RA, had seen service with the Royal Artillery on the Western Front in 1918. Posted soon after the Great War to Hong Kong and the Artillery garrison there, Mockridge Snr went on to serve in Burma from 1942 until 1944. George’s younger brother, JB Mockridge, served as a glider pilot in the Mediterranean and in France. Young George, who had seen Hong Kong as a toddler, attended Dulwich College from 1931 to 1935. The school, in London’s South, dates from 1619. As might be expected, George joined the school Officer Training Corps. At the private tutoring college of Carlisle & Gregson (otherwise “Jimmy’s”), he studied for two more years before attempting the competitive examination for entry to the Royal Military Academy, Woolwich, in which he succeeded, entering as a Gentleman Cadet in August 1937. From Woolwich, George Mockridge was commissioned to the Royal Artillery in January 1939. 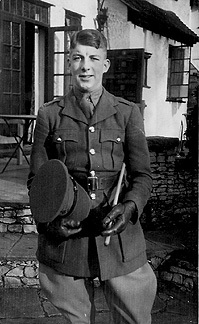 A 2nd Lt in the 3rd Medium Regiment RA, he served with the British Expeditionary Force (I Corps) in France from September 1939 until evacuated from Dunkirk, 31 May 1940. By January 1941 he had risen to Lieutenant. In March 1941, some two dozen Army men took the opportunity for a change of course: secondment into the RAF. Among the six young RA officers of this group were 2nd Lt George Mockridge and 2nd Lt Anthony Devenish. Both were granted commissions as RAF Pilot Officers on 8 March 1941 (London Gazette, 4 April 1941)—it may be that the two artillerymen already knew each other. Soon George had passed successfully through initial flying training at 13 EFTS White Waltham, in DH92 Tiger Moths. By May, he was at 9 Service Flying Training School Hullavington, passing out with his wings on 2 August. Mainly equipped with Miles Masters and Hurricanes (both of which George flew), at this time 9 SFTS was in fact a Group I School, no longer engaged in twin-engine training. In the end, however, Mockridge was to continue his training at 13 Operational Training Unit, Bicester, an OTU well-known to many, many Blenheim crews. At Bicester he came to grips with flying larger, twin-engine aircraft in the Blenheims there, though not, it seems, in any of their Ansons (which may have been the preserve of the Observers and WOp/AGs). From Fred Joerin’s Log Book and remarks, it was at Bicester that he, Mockridge and Devenish came to meet. They were all to see much service in Blenheims. George passed out successfully from OTU, to be posted to No 114 (Hong Kong) Squadron RAF at West Raynham in the last week of October 1941. The Squadron had been first to re-equip with the Blenheim I in 1937. Name apart, there was another association that can hardly have escaped George’s attention: they too, had served in France in the disastrous Spring of 1940, as part of the AASF. In France, the 114s took some early losses in the air, however, their own disaster came in the early morning of 11 May. Standing armed and fuelled ready for a strike on the Albert Canal, their airfield at Condé-Vraux was attacked by Dorniers in the dawn light: six aircraft destroyed on the ground immediately, the fuel dump destroyed, and all other aircraft damaged. The groundcrew laboured mightily in mounting a spirited defence, in removing unexploded bombs, and in repairing the least-damaged aircraft. Moved to Crécy then Nantes, by 20 May 1940 the Squadron was withdrawn to Wattisham. However it may have been, George Mockridge’s stay with 114 Squadron was short. Perhaps anticipating a move, on 10 November 1941 George married Joy Brockington (née Drummond), at Bromley in Kent. On 9 December 1941 he was posted to 107 Squadron as part of their deployment to Malta. It was a grim time. The Japanese had struck Pearl Harbour two days before. The family recall, that George left the UK on 8 December 1941, suggests that he must have flown out very soon after his posting. Unofficially “Lowestoft’s Own”, 107 Squadron had re-formed at Andover in the late summer of 1936, as another Hind unit of the RAF expansion programme. By August 1938 they were operating Blenheim Is. On the outbreak or war they were at Wattisham under 2 Group, where they took off in their Mark IV Blenheims on the first RAF operation of the war, the Wilhelmshaven raid of 4 September. In April and May 1940 the Squadron was very active: it was at this period that Bill Edwards, back in the UK from 211 Squadron, was first decorated and then, shot down, taken PoW. Returning from a two month attachment to Coastal Command at Lossiemouth, in May 1941 the Squadron was based at Great Massingham in Norfolk. From about this time onwards, 2 Group bomber Squadrons were contributing detachments of short duration to Malta, of key strategic importance in the Mediterranean theatre. By early September 1941, the air echelon of the Squadron was posted to the besieged Island to strike at Axis shipping, transport and airfields in North Africa and Italy. Meanwhile, on 5 December 1941 P/O ADE Devenish 45422 had also been posted to 107 Squadron with Fred Joerin as WOp/AG. That same day they took off from Bicester for Portreath. They were to ferry Blenheim IV Z7652 to Luqa via Gibraltar. Delayed a little by wireless trouble, it was 9 December before they set off, reaching Malta on 14 December after further delay at The Rock due to engine trouble. No details of George Mockridge’s trip or crew to Malta are to hand at present, however, by 18 December 1941 he was at Luqa flying an abortive anti-shipping sweep, with two other aircraft: Anthony Devenish (and Joerin in the turret) and a third 107 Squadron pilot and crew. Two days later, Mockridge and Devenish (again with Joerin) were part of a five-aircraft formation on another abortive anti-shipping strike, from which they turned their attention with some success to alternate ground targets in the Zuara—Ras El Alman area of Tripolitania. Quite apart from the dreadful news of Japan’s entry into the war on the 7th, in December 1941 and throughout January and February 1942 the state of affairs on Malta was grim, under very heavy Luftwaffe attacks that almost succeeded in cutting the Island off. The RAF Blenheim squadrons took heavy losses on the ground and in the air during this time. 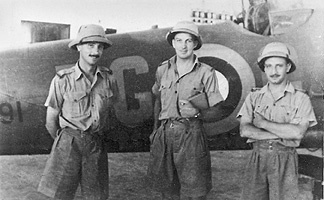 By 9 January 1942, 107 Squadron had been withdrawn to Egypt, where its aircrews were first rested and then, after some unrecorded muddling, posted to other Middle East Blenheim units like 84 Squadron and 211 Squadron who were re-establishing themselves on a grander scale before moving to re-inforce the Far East. Back at Luqa, 21 Squadron had come to relieve the 107s by late December. But by late February 1942 the same fate had befallen them and they, too, withdrew to Egypt as CO Bob Dagnall recounted. Thus it was in Egypt on 9 January 1942 that George Mockridge was posted to join 211 Squadron RAF, re-equipping with Blenheim IVs at Helwan as a 24 aircraft squadron. The Mockridge family recall is that George sailed to the Far East via Aden and Colombo. The remaining official records of this difficult period are sparse indeed, as much was later lost in the desperate days to come. The only records are either terse Service Record entries, personal Log Book entries, or the secondary published accounts of survivors or later compilers. By 10 January 1942, Devenish, his Observer, and his Gunner Fred Joerin had also arrived from Malta. Almost immediately they too were posted to 211 Squadron. Around this time, Sgt pilot Bill Sykens of 107 Squadron was also posted in. On 17 January George’s record was updated again, “211 Sqdn FE”. Their departure date for the Far East was near. Of the 24 aircraft of 211 Squadron, perhaps half, possibly more, were crewed by RAAF men fresh from 72 OTU or 70 OTU in the Middle East. The journey of the Squadron Air Party from Helwan (as four flights of six aircraft leaving over four consecutive days from 25 January 1942) is covered in detail on the Far East page and in the narratives for Bateson, Cuttiford, Dundas, Joerin, Keeping, Oddie and others. In Bloody Shambles, Shores, Cull & Izawa (Table 4) lists 18 of the 24 Blenheim crews of 211 Squadron sent from Helwan, apparently on arrival in Sumatra. Among the named aircrew are both Devenish and Mockridge (and his crew, Sgt Observer RD Mohr RAAF and Sgt gunner CG Sharley). Shores’ list as it stands is (not surprisingly) incomplete, and only 11 of the aircraft are identified by a serial number. No source is given and regrettably, there are several errors in the names and crew positions of personnel, and in the aircraft identities. For the aircraft, by working from the Flying Log Books and personal diaries of a number of Squadron members, reconciled with RAAF loss records in the National Archives of Australia, it has been been possible to compile a fuller account of 18 of the Squadron’s Blenheims and their crews in Sumatra and Java. Of the listed crews, at least five had old hands from the Middle East and Greece as pilot (the CO W/Cdr Bob Bateson, Ken Dundas, Hugh Clutterbuck, Anthony Devenish and George Mockridge), with a mix of similarly experienced crewmen (like Bill Baird, Gordon Chignall, Peter Dennis, Fred Joerin, Reg Mohr and “Jimmy” Riddle). It does seem, however, that Sgt Sykens was one of a number of aircrew to go with the Sea Party. Given the relative lack of experience of so many of the other flying crews, prudent and experienced command might well have provided some leavening of experience in the make-up of each departing group, in anticipation of a likely trail-back of unserviceable machines en route. Given their prior experience, then, Devenish and Mockridge and their crews seem more likely candidates for the Air Party than the Sea Party. As the Far East narrative recounts, the Sea Party aboard Yoma perforce missed the Palembang P2 deployment altogether, so the groundcrew and aircrew spare bods only caught up with the remnant Squadron air echelon after 16 February at Kalidjati in Java (or, for others, not until the final days at Poerwokerto and Tjilatjap). It seems most likely, then, that Shores’ Table 4 does represent most of the Air Party personnel arriving in Sumatra; and that George Mockridge and his crew were members of it, to operate from Palembang P2. From early-February and on to Java, the lack of records and the rate of attrition of aircrew and aircraft make a detailed account of crewing arrangements or operations practically impossible. Once formed, a crew was a sound unit indeed but men were pressed into service with other crews as the need arose, if others were absent elsewhere, ill, injured, lost or missing. In the final days, some aircrew became informally attached to other units, like 84 Squadron, as happened to Harry Wright for example. The difficulties of this period are vividly shown by the adventures of “Jimmy” Riddle and “Chig” Chignall with Z7643 at Pakenbaroe. It is certain that on the night of 11/12 February, F/O Fred Joerin was injured in the terrible crashes at Palembang P2 which, in destroying two 211 Squadron aircraft and one of 84 Squadron, killed both his pilot Hugh Clutterbuck and their observer, F/Sgt Herbert Grant Newstead 747854 in Blenheim IV Z7521. With broken ribs, Fred Joerin was evacuated to Batavia on 16 February. The remaining aircraft of the Squadron arrived in Batavia that day, moving to Kalidjati over the next two days. Somewhere either then or over the following two weeks, Joerin met up again with the 211 aircrew, noting in his October 1942 letter to the Mockridge family "George was with me at Bicester and flew out with us...I had been with him at Bicester and Malta and ME [Middle East] and met him again when he turned up with the rest of 211 squadron in Java." In the final days on Java, events moved rapidly. Kalidjati was over-run on 1 March with heavy casualties. That is the date recorded for the loss of George’s observer, RAAF Sgt Reginald Daly Mohr 400019. Although his fate is uncertain, he was last seen walking down a road near the airfield on that day. He has no known grave and is commemorated as one of the missing on the Singapore Memorial at Kranji. Once all remaining Blenheims had been pooled with 84 Squadron, from 26 February 211 Squadron personnel withdrew from Batavia and from Kalidjati by rail and truck towards Poerwokerto and Tjilatjap. It was clear that only a limited evacuation of RAF personnel would be possible. As CO, W/Cdr Bateson and his adjutant F/Lt Bright were left with the dreadful task of selecting those to go and those to stay. By brutal necessity that selection looked to aircrew and the most skilled trades. George Mockridge, Anthony Devenish and Fred Joerin were among those who got to Tjilatjap in time to be made one of the COs Tung Song party. Bright himself elected to stay with the men of the Squadron remaining behind to be taken captive by the Japanese. They were mainly groundcrew, like Ted Cole, Tom Fisher, Len Cooper, Eric Johnston, John S Robertson and Len “Abbie” Abbs—who always referresd to his Adjutant, with the deepest affection, as “Bright Eyes”. Of the 340 known to have been taken prisoner, just 160 lived to see their homes again. Meanwhile, George’s WOp/AG, RAF Sgt Cyril George Sharley 1167816 and Sgt Harry Wright, another WOp/AG, had become attached to a group of 84 Squadron men under their CO W/Cdr John Jeudwine, as they organised an escape per lifeboat from Tjilatjap. Their misadventures resulted in the bulk of the group staying behind on Kambangang island at the mouth of the river, while Jeudwine and eleven others continued to Australia by open boat (their own small Scorpion), in which they rowed off on 7 March. They were picked up by Catalina on 22 April near Shark Bay, WA. The story is told in Neate’s 84 Squadron history Scorpion’s Sting and in Global Warrior, the biography of Jeudwine. Sharley and the other 40 or 50 airmen remained on the island. On 9 March 1942 this group sent two parties of volunteers back to the mainland to search for food. Both groups fell foul of the Japanese in separate incidents, resulting in two men from each party being executed on the spot—one of whom was the unfortunate Sharley. He too has no known grave and like Mohr is commemorated on the Singapore Memorial. The story of the Tung Song is told in rich detail in Campbell & Lovett's So Long Singapore. There, George Mockridge is briefly but tellingly mentioned: he appears on the nominal roll of those few 211s evacuated from Java at dusk on 2 March 1942 aboard the little Straits steamer, as they disembarked at Fremantle on 13 March for 5 Embarkation Depot. This page records the arrival of P/O Mockeridge (sic) and P/O Devenish at Fremantle. Safely in Australia, 5 EDs job was to take care of them with kit, pay and so on until they were properly back in the RAF system. The PORs, roneoed off in bulk, circulated around the RAAF records channels and on to RAF Records. Imperfectly, of course—here for example the 5ED Clerks have not yet recorded all the Service numbers, and have mis-spelt George’s name to boot. But the system did work. During this most trying period, the RAF system kept quietly rolling on. In the midst of chaos, George’s Service Record duly noted his promotion to Flying Officer on 8 March 1942. It was that day that Java surrendered to the Japanese. 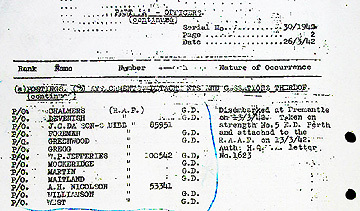 By 20 March, RAF Records at Gloucester had news of him from Australia by the POR system: “Attached RAAF POR 5/42” they noted with the scribblies simple brevity. After the disaster in Sumatra and Java in early March, the period of respite in Australia for those of 211 Squadron who were evacuated from Java aboard Tung Song was brief—about four weeks according to one old hand—before they re-embarked for India, arriving via Ceylon by early April 1942, as surviving records bear out. Others—groundcrew and aircrew from 211 and 84 Squadrons among others—were bound straight from Java for Ceylon, Bombay and Karachi aboard Yoma (from Batavia) and Kota Gede (from Tjilatjap). At this point, No 211 (Bomber) Squadron RAF had ceased to exist. It was not to re-form until August 1943, as a Beaufighter unit. Among the arrivals in India was George Mockridge, noted on their 9 April 1942 Personnel Occurrence Report by AHQ India before passing on a fortnight later to the friendly arms of 301 Maintenance Unit, the old 1 India MU, at RAF Drigh Road, Karachi. After the dramas in the Dutch East Indies in March and Ceylon’s narrow escape in April, surviving aircrew and groundcrew were being posted as needed to other units often in the India/Burma theatre. Given their skills, many went on to the Blenheim units already re-establishing themselves: 11 Squadron, 34 Squadron, 60 Squadron, 84 Squadron and 113 Squadron. There they met up again with many a comrade from the Middle East. George was one such, posted to 34 Squadron on 25 May 1942. One of many units re-formed in the 1930s RAF expansion, No 34 Squadron was another of those initially equipped with the Hawker Hind (at Bircham Newton in December 1935) before converting to the Bristol Blenheim I in July 1938. As the RAF looked beyond Britain in that time of ever-widening threat, 34 Squadron took its Mark Is to Singapore in September 1939. From December 1941 they took heavy losses over Malaya, then Sumatra and Java. Withdrawn by sea to Ceylon, the Squadron was re-established at Allahabad in April 1942. Re-equipped with Mark IV Blenheims and later with Bisleys, they operated over Burma until April 1943 when they stood down to convert to the ground attack role with the Hawker Hurricane IIc. Another Flying Officer on the left, possibly a P/O on the right, George centre with a book under his arm. All men wear the ST helmet: that head-gear and the Mark IV are signs that this image probably dates from 1942, perhaps at Ondal (Andal) or nearby Asansol in West Bengal, where the Squadron was based from June to December 1942. The aircraft is a twin-Browning equipped Blenheim IV of 34 Squadron wearing the codes EG-G (correct for 34 Squadron). The aircraft serial ends in 91, very possibly Z9591, certainly of 34 Squadron and later passed to 60 Squadron before being struck off charge as late as October 1944. George was slightly injured on 30 May, but no details of the circumstances are to hand. He had seen much and so far had been lucky. But now his good fortune ran out. On 9 September 1942, a combined raid by unescorted Blenheims of 34, 60 and 113 Squadrons was tasked with a low level morning attack on shipping in Akyab harbour. George Mockridge and his crew did not return. Published accounts of the action differ on the number, origin and losses of the aircraft present, either 9 or perhaps 13 in all. Although their attack was successful, scoring hits on ships and jetty, three aircraft and their crews failed to return and at least one other force-landed without loss on return. On this occasion, George was flying with a 60 Squadron crew: DH “Bruno” Brown, 22 (Bob Dagnall’s long-time observer from ME days) and GR “Garry” Hall, the 20 year-old RAAF gunner who had survived stints with 36 Squadron in Sumatra and Java before reaching 60 Squadron at Asansol. Their aircraft, V5425 ‘Y’, was a Mark IV Blenheim which had previously seen service with 84 Squadron. Blenheim V5425 of 60 Squadron was piloted by Pilot Officer GA Mockridge 45431 attached from 34 Squadron with 754217 Sgt Brown DH and Aus 401034 Sgt Hall GR both of 60 Squadron as observer and air gunner respectively. V5425 was one of a vic of three aircraft of which only one returned. The vic (led by Aus 404619 F/O Bassingthwaite of 113 Squadron) turned in to attack at 10.15½ hours. Just after the attack the leading gunner reported fighters, and V5425 was lagging behind a little. The leader throttled back until formation was tight and flew out to sea at low level. Four fighters were making attacks, both from astern and ahead. An area was reached where there was suitable cloud cover at about 800’. The leader waited for an opportunity and when he judged that the fighters were out of position for an attack, climbed towards the cloud, but a couple of attacks were made before the formation entered cloud. The leading gunner reports that at this stage V5425 had broken formation and was attempting apparently to change to echelon right, but finally left the formation. On the formation re-emerging from the cloud, it was not seen again. Notably this report deals with a single vic of the three or four involved. Ideally, all vics would have kept a tight formation. In the Blenheim, even a Mark IV with a twin-Browning turret, close formation in vics of three was the key to defence: woe betide the poor straggler, or those who broke formation, or indeed the No 2 or No 3 to a leader who turned so tightly that following was impossible. If George’s aircraft was already damaged, the outlook was poor. On 4 October Fred Joerin, now with 60 Squadron and regular W/OpAG to Banks the CO, was able to write to the Mockridge family once they had been officially informed of George’s loss. His Air Mail Letter Card was delivered in England in late January 1943. In his letter, Fred remarked that he was in part quoting the official report and indeed he closely followed his CO’s description of the formation under attack. Fred also mentioned that there was light AA during the attack itself, and that the remains of two downed aircraft had later been sighted. Like many others with mates posted as missing, he was cautious in expressing the hope that George and his crew might turn up. About the same time, W/Cdr TA Cox, CO of 34 Squadron from June 1942 to April 1943, was sending his condolences to the Mockridge family in the United Kingdom. 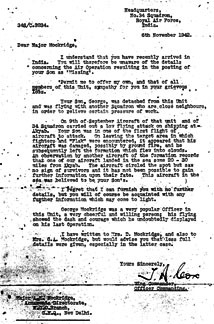 When he became aware that George’s father Albert had recently arrived to serve in India, he set to and wrote a further letter. “Your Son, George, was detached from this Unit and was flying with another Squadron who are close neighbours, in order to relieve certain pressure of work. George and his crewmates, Sgt Don “Bruno” Brown 745217 and the Australian Sgt “Garry” Garrick Hall 401034 were never found. But his story, so closely entwined with those of other Blenheim men, can still be recounted thanks to the interest and generosity of Jeremy and Kathryn Mockridge in making treasured family mementoes available for the drafting of this page. Given the records of the time, George is recorded as of 60 Squadron on the CWGC Honour Roll, while Garry Hall is recorded as of 36 Squadron by the AWM Honour Roll. Only Don Brown is correctly recorded, with 60 Squadron. Such is the fortune of war. As with George’s original 211 Squadron crewmates RD Mohr and CG Sharley, all are commemorated on the Singapore Memorial, at Kranji War Cemetery in Singapore. Son of Major Albert Henry Mockridge and Dorothy Mockridge, of Barons Keep, London.